Why do helium balloons float? If you've seen the heartwarming Disney movie Up!, then you surely know what we're talking about: a magical moment when a house, lifted by hundreds of colorful balloons, flew off the ground and up in the air. And while it might be nearly impossible to recreate that moment in real life, lifting something lighter, such as you, is perfectly achievable. All you need is a lot of helium balloons. How many? Well, this is exactly what our helium balloon calculator figures out! Before we determine how many helium balloons lift a person, let's start with a bit of theory. Why do these balloons float in the first place? It happens because they are filled with helium - a gas that is lighter than air. You probably already know the phenomenon of buoyancy. For example, an inflatable mattress floats on water, because the air it's filled with is lighter than water. The same principle applies here: as helium has a density lower than the density of air, a balloon filled with this gas will start moving up. The density of helium is equal to 0.1785 grams per liter. The density of air, on the other hand, is about 1.25 grams per liter. Leaving some tolerance for the weight of the balloon and the string, we can approximate that every liter of helium has a lifting force of one gram. There are a few more gases that are lighter than air, such as hydrogen, ammonia, or methane. They are not commonly used in balloons as they are easily flammable. 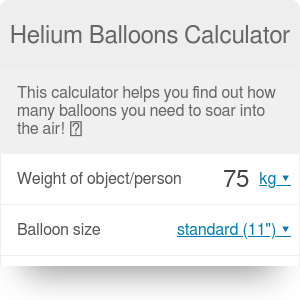 Nevertheless, you can change the gas type in this helium balloons calculator to compare between them and helium. Let's get on with the calculations! As you already learned in the previous section, the lifting force of helium is approximately one gram per liter. It doesn't seem like much, that's why you will need a lot of balloons to start flying! Determine your weight - for instance, 75 kg. This number should include everything that will be flying, so your clothing as well. Every gram counts! Choose the size of the balloons. Let's assume we are using regular balloons from an amusement park, with a diameter of 30 centimeters (11 inches). In the advanced mode, you can enter a custom size of the balloon. You will need roughly five thousand balloons to fly. It's quite a lot, isn't it? If, however, you chose balloons that are 12 feet in diameter, you would only need three of them to lift you up! At the beginning of this article, we mentioned that recreating the memorable Up! moment is short of impossible. Well... a team from National Geographic accepted this challenge. In 2011, they constructed a special lightweight house and lifted it up in the air, using 300 eight-foot-tall balloons. The house soared 10,000 feet into the sky and flew around for approximately one hour. Helium Balloons Calculator can be embedded on your website to enrich the content you wrote and make it easier for your visitors to understand your message.